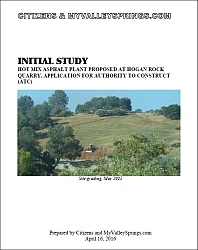 Construction and operation of a new asphalt plant at the existing Foothill Materials aggregate rock mining operation at Hogan Quarry was proposed by owners Ford Construction and administratively approved as a "permitted use by right" in the industrial zone by the Calaveras County Planning Director on April 30, 2015. Two separate Appeals of that decision were filed on May 15 by MyValleySprings.com and the Calaveras County Water District. CCWD released an Agreement Regarding Withdraw of the CCWD Appeal on June 23. On May 18, CB Asphalt submitted an application for Authority to Construct (ATC) the asphalt plant at the Hogan quarry. On May 29, the County determined the ATC application was "incomplete" and was also a "project" subject to CEQA environmental review. Ford Construction/ CB Asphalt filed an Appeal of that decision on June 10. Planning Commission Public Hearings on the first set of Asphalt Plant Appeals were held June 25 and continued to July 9, 2015. Public testimony against the asphalt plant was extensive. The Planning Commission denied both MyValleySprings.com's "permitted by right" appeal and Ford Construction's "ATC project"/ CEQA appeal on July 9. Click here to watch June 25 and July 9 PC meeting videos (both days in 2 parts). On July 2, the County determined that "applicant's proposal to add a Hot Mixed Asphalt Plant will involve the use of a hazardous material that may have a significant effect on the environment" so the proposed project will require a Conditional Use Permit. On July 10, Ford Construction filed two new Appeals: 1) to the Board of Supervisors of the ATC/ CEQA determination, and 2) to the Planning Commission of the Hazardous Materials/ Conditional Use Permit (CUP) requirement. On July 23, MyValleySprings.com filed a new Appeal to the Board of Supervisors of the "permitted by right" zoning determination. Both Board of Supervisor Appeal Hearings were held on August 11. Again, public testimony against the asphalt plant was extensive. The MyValleySprings.com appeal was denied, and then the Ford ATC/ CEQA appeal was denied by the BOS. Click here to watch August 11 BOS meeting video (in 2 parts). On August 13, Ford's appeal of the Hazardous/CUP requirement was heard by the Planning Commission. After 5-1/2 hours of testimony and discussion, commissioners wanted more information & analysis, and continued the hearing. On Sept. 10, information requested had not yet been received, so the hearing was continued to Oct. 8, then continued to November 19, then the appeal hearing was continued to December 10, 2015. Click here to watch the August 13 Planning Commission video (in 2 parts). Click here for Planning Commission page for Meeting Agendas and Staff Reports. On December 10, Ford/CB Asphalt's continued appeal of the Hazardous/CUP requirement was heard and decided by the Planning Commission. After receiving new information in November, Environmental Health's conclusion remained the same as it was in August—that the asphalt plant's use of hazardous materials may have a significant effect on the environment. The recommendation was to uphold the Health Officer's and Planning Director's Hazardous/ CUP required determination. Click here to read the analysis, reasons, and conclusions in the 15-pg. Staff Report. After 4-1/2 hours of heated debate, commissioners disagreed with Environmental Health's recommendation and expressed their intent to grant the Ford/CB appeal, finding that there would not be a significant effect on the environment. Click here to watch the Dec. 10 meeting video (@ 2 hrs. in on Part 1; continues on Part 2). Staff's original Dec. 10 Resolution and Findings had to be revised to concur with the commission's surprise finding, so the hearing was continued for 1 week. On December 17, the Planning Commission adopted revised Resolution 2015-019 stating the asphalt plant "will not have a significant effect on the environment" and "a Conditional Use Permit is not required." At the hearing, MyValleySprings.com testified against and submitted Comments on the revised Resolution and Findings. The Planning Commission's asphalt plant decision was appealed to the Board of Supervisors by MyValleySprings.com and five other Appellants. Click here for MyValleySprings.com's Appeal of Planning Commission Determinations. All appeals were scheduled for a Public Hearing at the Board of Supervisors on February 9, 2016. Click here for "CALL TO ACTION!!" informational flyer. 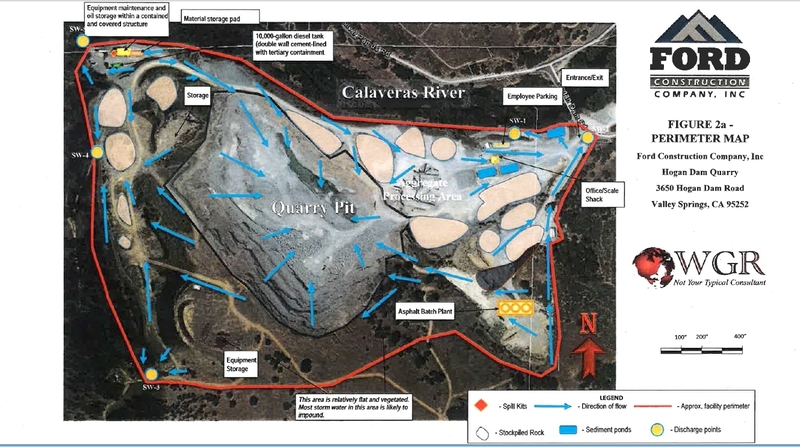 On February 9, 2016, the Calaveras County Board of Supervisors voted 3-2 to deny all 6 asphalt plant appeals for a CUP, because "the proposed use of hazardous substances at the asphalt plant proposed for Hogan Quarry does not rise to a level where the substances may have a significant effect on the environment, and because of that determination a conditional use permit is not required." Click here to watch the Feb. 9 Board of Supervisors meeting video (Planning & Appellants start 1/2 hr. in on Part 1; Board discussion and asphalt vote on the last hour of Part 2). After this "no CUP" decision, Appellants and other Valley Springs citizens pursued other legal options. Some pursued litigation, some focused on politics and a recall of their District 5 supervisor, and others decided to address the scope of environmental review for the pending Authority to Construct (ATC) for the asphalt plant (required under CEQA). There was a strong possibility that this review by the County Air Pollution Control District (APCD) would be focused on Air Quality only, not a broad review of all environmental impacts (such as traffic and water). MyValleySprings.com worked with citizens on CEQA review for two months, identifying 13 categories of environmental impacts of the asphalt plant project. We researched, wrote, and produced the April 16, 2016 Citizens & MyValleySprings.com Initial Study on the Hot Mix Asphalt Plant at Hogan Rock Quarry, which was submitted to the County APCD on April 19. See Press Release: MVS submits Citizens Initial Study on Asphalt Plant. For more details on the initial study and impacts, click here to read the document. On April 19, MyValleySprings.com was informed by the County that the APCD now intends to prepare a "full-scope EIR" (Environmental Impact Report) for the Hot Mix Asphalt "that will address all potential impacts." A full EIR is good news! All potentially significant impacts will have to be identified; feasible mitigations to reduce impacts must be identified and implemented; and significant and unavoidable impacts can lead to findings to deny the project, based on lack of overriding considerations. The County waited months for Ford/CB Asphalt to commit to pay for the EIR and sign an Indemnification Agreement. After repeated inquiries by MyValleySprings.com, the Air Pollution Control District (APCD) informed us on June 9, 2016, that they are NOT proceeding on the EIR until the applicant and landowners sign the indemnification agreement (previously sent by County Counsel). On June 21, a Supervisor Press Release was issued stating 'Hogan Asphalt Plant Moving To Carson Hill' and District 5 Supervisor Steve Kearney announced, "Over the weekend that equipment was picked up and moved to another location in the county." However, this statement was not accurate, as asphalt hot plant equipment was disassembled, but remained on site (see CB Press Release and our photos below). 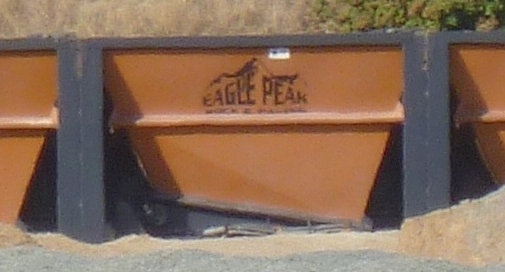 On July 15, CB Asphalt issued a Press Release stating (among other things) "the first piece of the Hot Plant was moved Monday on July 10, 2016 from the Hogan facility to the Carson Hill facility" and "the present Hogan ATC application is incomplete and denied by the County due to missing elements." This ATC denial was confirmed by the APCD on July 18: "The Authority to Construct application for a hot mixed asphalt plant at Hogan Quarry was disapproved by the Air Pollution Control Officer on July 11, 2016. At this point, they would need to submit a new application, including a fully executed indemnification agreement, so that we would be able to proceed with the preparation of an Environmental Impact Report. " On July 20, the large asphalt dryer & mixer drum was removed from the Hogan Quarry site. By July 29, 2016, asphalt hot plant equipment was GONE. 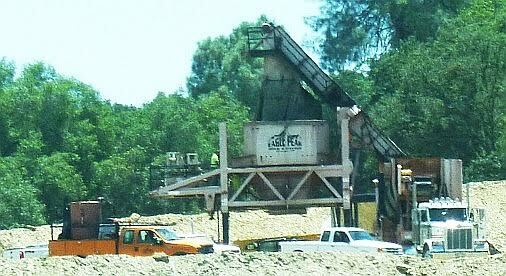 An asphalt plant at the Hogan Quarry site is still a possibility. CB Asphalt is considering "the likelihood of a second Hot Plant facility...in support of our goal to construct and operate a Hot Plant at the Hogan facility." It remains to be seen if paying for a full environmental impact report and mitigating all potentially significant negative impacts of the proposed asphalt hot plant "pencils out" for CB Asphalt and Ford Construction. Check back for updates or Sign up for our E-mail Newsletter. For Planning Department Contact Information, visit the Calaveras Planning Department page. To contact County Supervisors, visit the Board of Supervisors page. Click here for ATC Asphalt Plant "plot plan"